Catalog Nos. : 18727 (SA26) and 18728 (SA27). The vegetative form of B. anthracis forms spores when nutrients in the environment, such as amino acids, nucleosides, and glucose, become depleted. These spores can survive for many years and will germinate into the toxin-producing vegetative form of B. anthracis when they are exposed to a nutrient-rich environment. Antigen: Detergent extract of B. anthracis spores. These antibodies recognize different epitopes of a 92 kD S-layer protein. They do not cross-react with B. anthracis PA, EF, LF, or vegetative forms. They also do not cross-react with spores or vegetative forms of B. brevis, B. cereus, B. megaterium, B. subtilis, or B. thuringiensis. 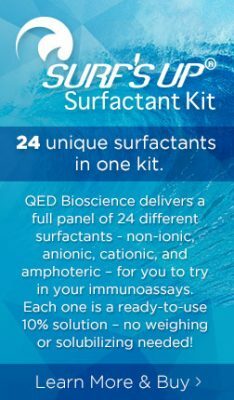 Immunoblotting: use at 5 ug/ml. Sandwich ELISA: use coating antibody (18727) at 5 ug/ml; use detect antibody (18728) at 1 ug/ml.